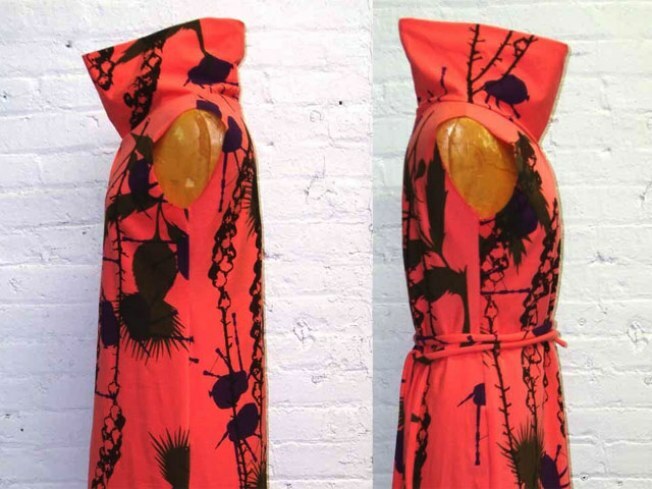 Shop 50 NYC Etsy vendors (like BetterThanJam, whose dress this is) at the Handmade Cavalcade on Saturday. Sink your shopping dollars in the local economy this Saturday when you shop at the Holiday Handmade Cavalcade in Nolita, held by TheNewNew, a group of 50 independent artists and artisans selected from Etsy's most talented local vendors (such as BetterThanJam, maker of wonderfully unusual wearables like the thistle-print cowl dress, pictured). So what's for sale? Everything and everything, as long as it's handmade, high-quality, unique and (almost always) eco-friendly: clothing, home décor, jewelry, accessories, paper goods, bath and body products, toys, baked goods, you name it. You'll recognize some of the vendors from seeing their merchandise in local shops; here, you're buying straight from the source, so expect savings aplenty. Lead Cavalcade sponsor Etsy is joined by plenty of others, including ReadyMade magazine, Fine & Raw Chocolate, Yelp, Purl Soho, and the Brooklyn Indie Market.